The ghost town of Virginia City in south-western Montana, not far from Yellowstone Park, boasts a single hotel, with a balcony in front. At the end of the balcony is a double-decker privy, one seat above the other. The holes are off-set; but if you chose to 'sit' on the ground floor, remember not to lean to the right! Gongfermors or gong-scourers were men who went round emptying medieval previes and cesspits. Where there was no convenient moat or stream, people dug a pit, or used a removable barrel. In either case the sewage had to be removed in due course. In 1281, 13 men took five nights to clear the cloaca at Newgate Prison---on triple pay! At Hampton Court in Henry VIII's time the gongfermors had a formidable task. Some people have a compulsion to write on the walls of public lavatories, probably because they have spare time and a public place to write, but can create the work in private---and it remains anonymous. Unfortunately, most of the things they write on the walls are rude, crude and not very funny. I have seen a few that have amused me; for example in a university biochemistry department GOD IS ALIVE AND WELL AND WORKING ON A LESS AMBITIOUS PROJECT. And along the bottom of a partition between cubicles in the office loo BEWARE LIMBO DANCERS! The habit of writing on the walls is far from new. On a loo wall in the city of Herculaneum, buried by ash from the eruption of Vesuvius in AD79, is written APOLLONIVS MEDICVS TITI IMP. HIC CACARIT BENE. In other words, "Apollonius, physician of Emperor Titus, had a good crap here." A survey by the London Regional Passengers' Committee in the stations of the London Underground and British Rail found that 77% of men's cubicles were adorned with graffiti, and 79% of women's. An anonymous spokeswoman said "The answer is simple---we sit there longer, write faster, and have dirtier minds!" Edmund Beckett Denison, first Lord Grimthorpe (the designer of Big Ben), was annoyed by slovenly visitors. 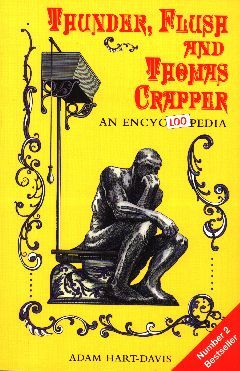 He introduced a cunning device into his lavatory; once the user had locked the door it could not be opened until the loo had been flushed.